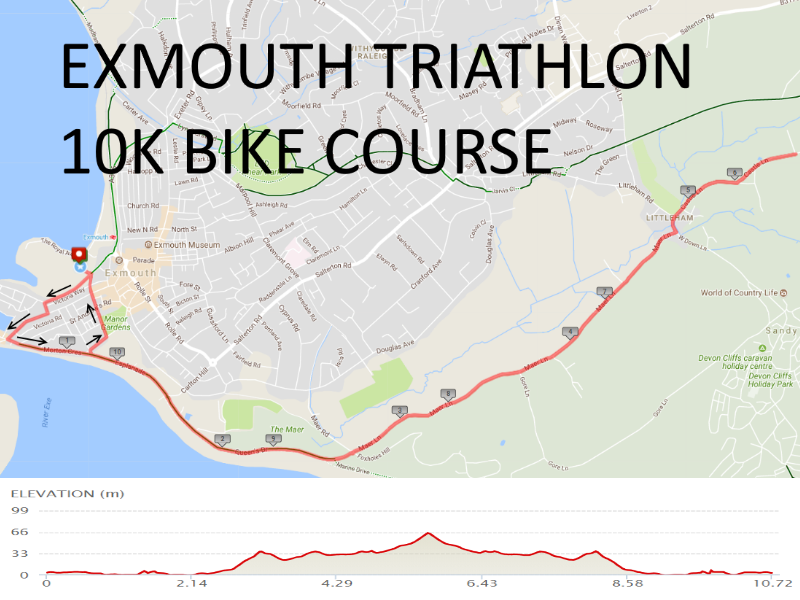 Exmouth Triathlon (Junior & Senior ) for all ages from 8+ is due to return on the same Sunday in 2019 with a completely redesigned start/finish & transition area in front of the rugby club grandstand & new in/out for the bikes using the gate near the roundabout. There will also be a gap of approx 30 mins between the main races & the junior races. It will start with the youth, junior and adult races at 7.30am to avoid traffic on the bike course. The traffic-free Tristar events will take place later in the morning. There is a pool based swim, followed by a ride around the Rugby Club pitches for the Tristars or a ride around the country lanes for other categories. You finish with a run at the Rugby pitch for Tristars or along the river path for other categories. The swim in the 25m pool is followed by an out and bike bike ride around the lanes for Youth, Junior and Senior categories. Go Tri Beginners do a shorter 10K out and bike bike ride. 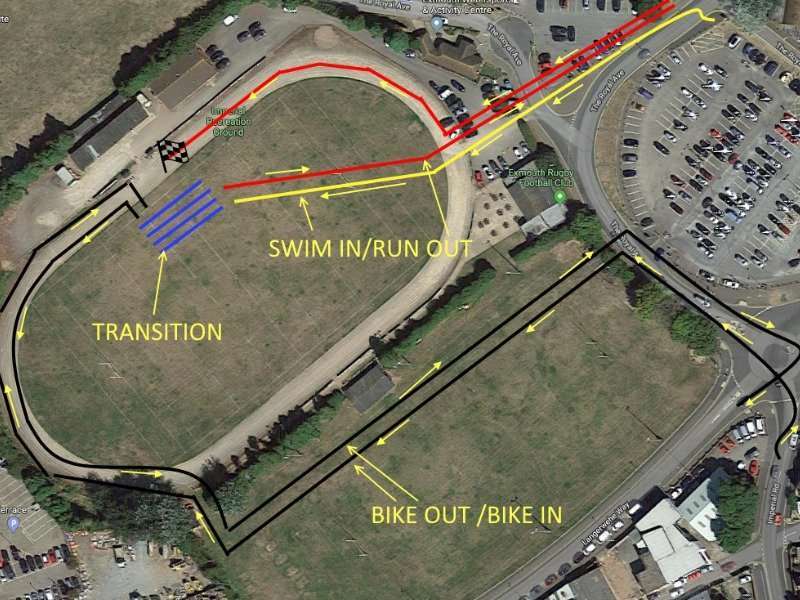 Tri Stars (from 8-14) ride around the bike circuit at the rugby club + an extra grass loop. Also new for 2019 are novice kids races. Redesigned 2019 Transition area. The finish line will be in front of the grand stand which is better for spectators. Bike Out / Bike In have been completely separate from Swim In & Run Out/In to avoid congestion. The run route uses the river path. Great views, traffic free & flat! The turn for the 5K is just at the end of the wooden board section. The Go Tri Turn is at 1.25K next to the water station. 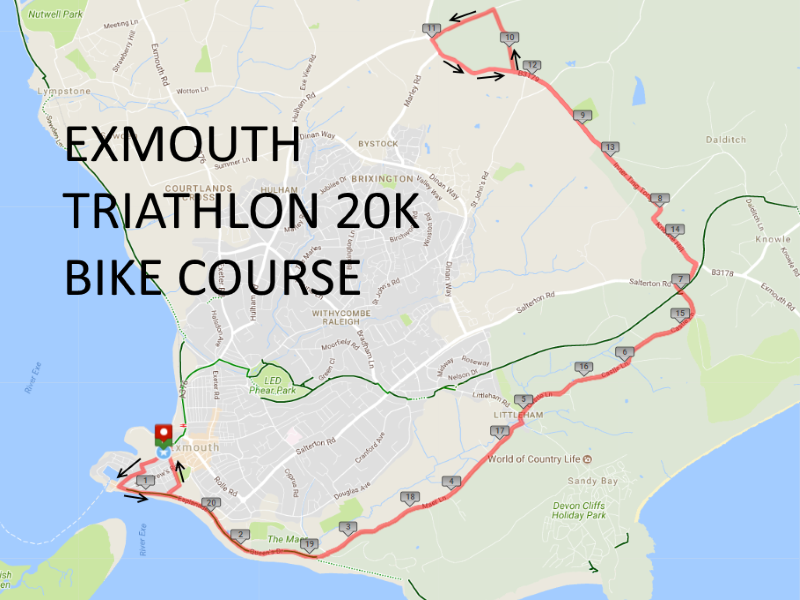 Out and bike Go Tri bike course which starts along the sea front before climbing gently up towards Woodbury Common and returning. Turn is just past the farm on the left in the layby. Professional chip timing (including transition splits) and prizes. A swimming costume, any road worthy bike, a helmet and a pair of trainers and you are ready to take part. Front crawl or breaststroke, all in one go or stop after every length, it’s your choice. Swimmers are grouped by ability so it’s fun for everyone. We also have a Go Tri category aimed at beginners.